Bitter herbs – the maror – are part of the Seder ritual, symbolizing the bitterness of slavery experienced by the Jews in Egypt. Endive, romaine and chicory (for which I’ve substituted radicchio) are present on many Sephardic ritual platters, but often they also appear in salads served with the meal. This can be served as a separate course or as a side dish. Wash and dry the romaine lettuce leaves and break into medium pieces. 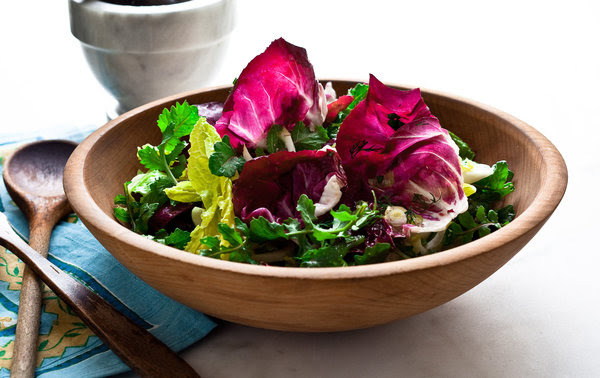 Separate the radicchio leaves and cut into medium pieces. Rinse and dry the endives and slice crosswise about 3/4 inch thick. Toss together all of the greens, the celery and the scallions in a large salad bowl and sprinkle the herbs over the top. Skin the garlic clove, cut in half and remove green shoots. Place in a mortar and pestle with a generous pinch of salt and mash to a paste. Work in the lemon juice and then the olive oil. Taste and adjust salt. Transfer to a jar until ready to serve the salad. Just before serving, shake the dressing in the jar, pour over the salad and toss. Advance preparation: The greens can be prepared, wrapped in a clean kitchen towel and then sealed in plastic bags and refrigerated, several hours ahead. Most of the calories come from the dressing; you can use less to reduce them. Despite his cruelty, R. is afraid to leave her domineering husband for fear of orphaning her children completely. For the time being she and her hospital social worker submitted an application for an emergency Lemonade Fund grant that will be deposited in a new separate bank account that R. opened on her own. (In special cases such as this, grant checks can either be sent to the recipient via the social worker, or wired directly to the recipient’s separate bank account.) In this way, R. will have a sum of money that is completely her own, to spend as she sees fit. Though her situation remains precarious, R. will have a modicum of control of her own life…a small step toward personal empowerment (and maybe more,) during a very difficult time. We would like to make a donation to the Lemonade Fund in memory of our mother, ——-, who passed away in 2017. She suffered from breast cancer at age 45, but survived to live an active and rich life until the age of 85 when she passed away from breast cancer. Stage 4. Throughout her life she was a true and brave warrior in the face of illness, tragedy and hardship. She was always active and optimistic and yet gracious and accepting of death at the end of her life. We would love to pass on a little part of her optimism to other women and hope that we can offer a little assistance to those women who are currentlty finding their own battle. 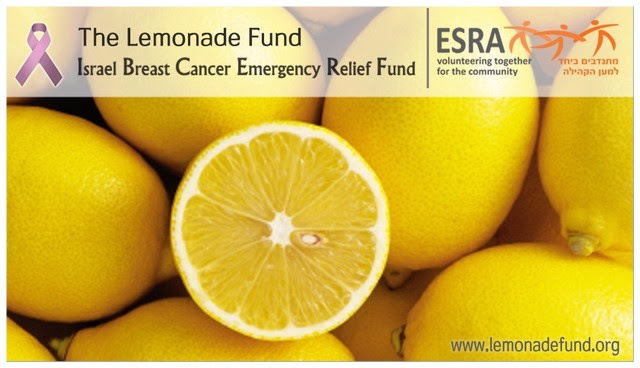 YOU can help needy Israeli breast cancer patients by sponsoring ESRA Lemonade Fund grants. Donate any amount Thank you!!!!!! Tax deductible receipts are available for Israeli, US, UK or Australiandonations. News****We are grateful to JNF (קק’ל) Australia for including the ESRA Lemonade Fund as one of their JNF SPECIFIC AND VITAL PROJECTS IN ISRAEL! Thank you!!!! We continue to be grateful to Myisrael for supporting the ESRA Lemonade Fund as one of their charity projects. G. and her husband, a couple in their mid 50’s, from northern Israel, were living an average Israeli life. Married, with 2 adult children, they were doing well until illness struck. Recently, G.’s husband was diagnosed with a psychiatric problem that rendered him unfit to work. As a result, G., developed stress-related disorders, such as diabetes and heart problems, followed by a breast cancer diagnosis. She is now getting chemotherapy and neither spouse can work. They are barely making ends meet on their disability benefits, and they’ve gone into debt. Their financial situation is causing both G. and her husband, enormous stress, and their case was referred to the Lemonade Fund by G.’s social worker. It is important to note that many of our grant recipients recover from their illnesses and go on to rebuild their lives, financially. The Lemonade Fund was created to help alleviate crushing economic pressure that can hit even formerly solvent families as a result of a breast cancer diagnosis. It is our privilege to help. One of the ways we express joy and gratitude on the upcoming holiday of Purim is through ‘matanot l’evyonim,’ helping the poor. Please consider a donation to the Lemonade Fund as your ‘matana l’evyonim,’ this Purim. Thank you. Pulse the flour, baking powder, salt, sugar, almond paste and lemon zest in the food processor until well combined. Add the poppy seeds and pulse to combine. Add the margarine and shortening and pulse until mixture resembles a coarse meal. Add the beaten eggs and pulse until combined. Remove the mixture from the food processor and pour it into a large bowl. Sprinkle with two tablespoons of ice water and mix until it comes together into a ball. If the dough seems dry add the remaining water juice. Divide the dough in half and roll each piece out between two sheets of lightly floured parchment paper. Stack the dough, with parchment attached, on a large cookie sheet and chill for at least 30 minutes, or until firm. Remove dough from the refrigerator and cut into circles using a round cutter or the mouth of a drinking glass. Fill each circle with a small amount of filling. 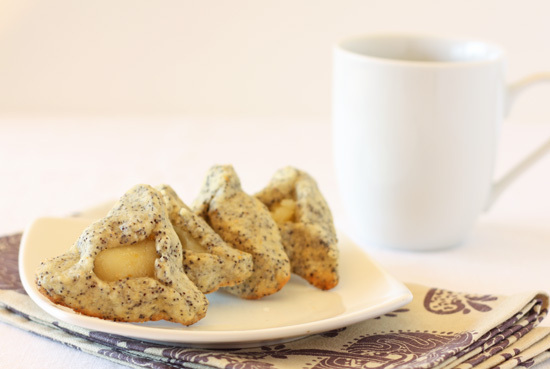 (For 2 inch circles use about a teaspoon of filling). Brush each circle with the egg wash and fold two sides together, pinching tight to make a corner. Fold up the remaining side to make a triangle with the filling showing in the middle and pinch the other two corners well. It is important that they are well pinched, so that they do not come open in the oven. Bake at 350 until they are slightly firm to the touch, about 11 minutes.